I love the name of this wine – Il Brutto. It works best if you say it as though you were an Italian film announcer, the kind of guy who would introduce a trailer for the next action hero block buster “Il Brutto – the Italian cowboy” Go ahead try it in your head, now try it out loud. Admit it, you enjoy being an Italian film announcer. Unfortunately Il Brutto translates as “The Ugly”, not the good, not the bad, just the ugly. It’s not a comment on the label design, or even the wine, it’s because it’s made from grapes grown on old vines which are, well, old and gnarly so they could be described as ugly. They could also be described as majestic, but they went with ugly. 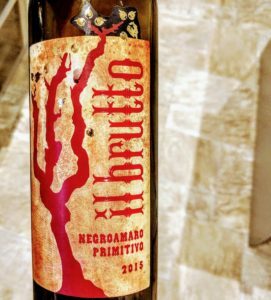 This Il Brutto Negroamaro Primitivo Salento IGT ’15 is a deep, dark almost black colour (no doubt like the soul of our Italian action baddie) and it has reasonable legs that show a lighter red. It smells dark too – old wood, thick brambles, black berries, wood smoke. It tastes of black and dark fruits too, plums, damsons, blackberries, black cherries with just a little green herb taste and lots of smoked pepper and spice. It’s also a little sweet. It’s not a sweet wine by any stretch, but the fruit gives it a sweet edge that works nicely with the smoky spice. The alcohol level is squarely in the medium range, and there’s soft ripe tannins along with some firm tannin. Combined with all the fruit it has quite a full mouthfeel. Priced at £10 from Laithwaites I think it’s at the upper end of its reach, but as part of a mixed case or special deal it often comes in closer to £8 which is keenly priced. Now I’m off to play Carson City, listen to some Ennio Morricone or maybe watch some fine Spaghetti Westerns to enjoy with the next bottle.